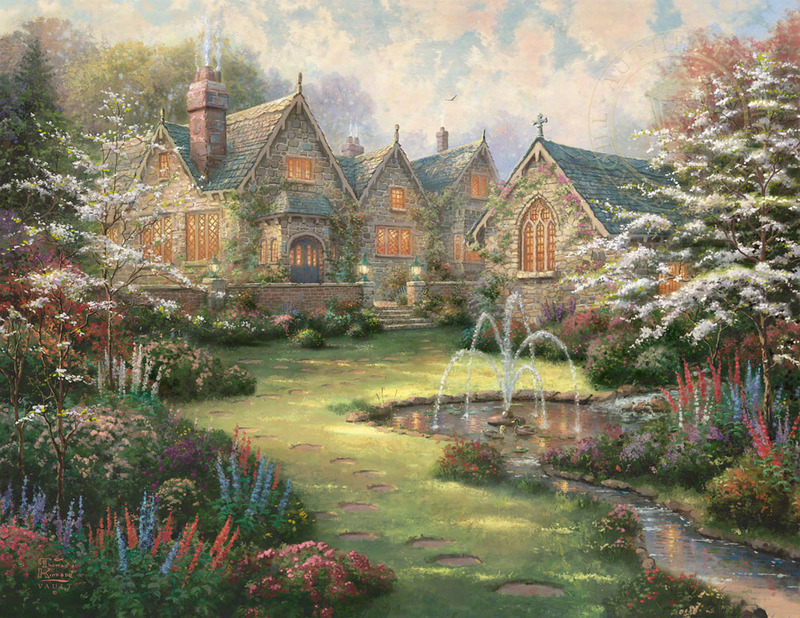 The English Manor House was a long-time favorite subject of Thomas Kinkade's. He was charmed by the stateliness of the architecture and romanced by what he imagined life was like for the couple who lived there. The bright and glowing windows spoke of family and a loving togetherness that gave special meaning to the passing of each day. The flower gardens surrounding the manor are so lovingly cared for giving evidence to the nurturing hands that tend to the home. Thom loved traveling to England and with each trip he would return with a trove of ideas that he hoped to translate into a masterwork in oil. In addition to Thom's travels, the inspiration behind his Mansions in Paradise series came from the Biblical verse, John 14:2, "in my Father's house are many mansions…"
Garden Manor, the second release in this series and a companion to Thom's popular painting Lakeside Manor, is an example of one such inspiration drawn from Thom's archive. One can almost smell the flowers and feel the brisk air as you allow your eyes to stroll up the grassy path to the inviting door of this exquisite home. The splashing of the water from the fountain entertains your ear while the anticipation grows for the glorious gathering of family and friends waiting just beyond the threshold. Join us at Garden Manor and celebrate life as God intended, serenely happy and wrapped in the comforting surroundings of a life well lived. To all those who loved Thom and his work, I want to thank you all for sharing the light.